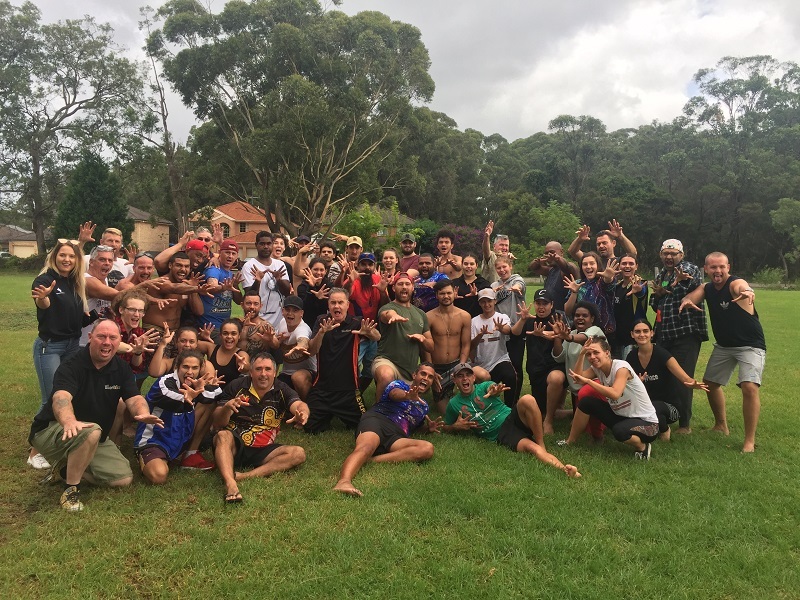 On Friday 15 March, NAISDA’s Developing Artists enjoyed a visit to The Glen – an alcohol and drug rehabilitation centre located on the Central Coast. The centre is doing fantastic work in the rehabilitation of Indigenous and non-Indigenous men experiencing drug and alcohol addiction. The afternoon was an opportunity for our Developing Artists to learn more about this important community organisation and get to know some of the residents, who kindly shared their stories with the Developing Artists, giving a raw and honest insight into drug and alcohol addiction. The Developing Artists also enjoyed a tour of the facility and challenged the residents to a game of volleyball and touch footy. In true NAISDA style, the day ended with a dance-off, where each side unleashed their deadliest moves. NAISDA Developing Artist Support Officer, Adelle Grogan, said that NAISDA has long enjoyed a close relationship with The Glen and its residents. “We are thrilled to have residents of The Glen attend many NAISDA events throughout the year, including our Graduation ceremony, mid-year and end of year shows. They’re always out there in our audiences, supporting NAISDA,” said Adelle. “NAISDA plans visits to the centre three to four times a year, giving our Developing Artists an opportunity to get out of the studio and meet members of the community. We’ll also be hosting them as part of NAISDA’s Mabo Day celebrations later in the year. “Our Developing Artists always really enjoy their visits, and I know that the Glen boys do too, so it’s always a great experience for both sides,” she added. Adelle said that social inclusion is an important part of NAISDA’s holistic support approach to learning. “Through partnerships with organisations like The Glen and the Barang Pelicans [the Barang Regional Alliance youth network], our Developing Artists are given an opportunity to meet other youth in the community, outside of NAISDA’s walls. “We are at risk of being a little isolated up here on the Mountain and encourage our Developing Artists to expand their network of friends and voice in the community wherever possible,” she added. NAISDA is committed to providing a learning space that culturally, creatively and holistically affirms and supports our Developing Artists. To learn more click here.